Home Wooden Watch: Can anyone catch Zion Williamson? Zion Williamson seems a lock for the award, but Grant Williams might be able to catch up to him. Anything can happen in the Wooden Award race. Remember, Victor Oladipo nearly snatched the award from Trey Burke during the 2012-13 season despite being omitted from the midseason list. And last season, many assumed Trae Young’s furious start would lead to a Wooden Award, but Jalen Brunson won the honor. That being said, this season might not feature similar drama. One player (you know who) has moved closer to locking it up. Zion Williamson: Duke’s loss to Syracuse on Monday didn’t change Williamson’s status. The Duke freshman has an undeniable presence. When he missed the entire second half at Florida State on Saturday because of an eye injury, the Blue Devils struggled to finish around the rim against the Seminoles’ lengthy athletes. Against Syracuse on Monday, Williamson finished with 35 points, 10 rebounds and four blocks, a stat line that wasn’t enough to stop the Orange in overtime but helped Duke account for the missed production from Cam Reddish, who sat out with an illness, and Tre Jones, who did not play most of the game after suffering a shoulder injury. With Jones expected to miss a significant stretch, Duke will need Williamson to play the aggressive, efficient basketball that has defined his first — and likely only — season on campus. He has made 74 percent of his shots inside the arc, ranking ninth in the country. Let’s be clear: This is a wild number. Ken Pomeroy has tracked 2-point field goal percentage since the 2003-04 season. Since that year, no Power 5 player under 6-foot-8 has made 74 percent of his shots inside the arc. Lonzo Ball (73.2 percent) came close two years ago. But Williamson’s numbers are typically reserved for traditional big men who hover around the basket. But even the latter category is filled with legends who haven’t duplicated Williamson’s effectiveness around the rim. Kareem Abdul-Jabbar made 67 percent of his 2-pointers during his debut season at UCLA. Shaquille O’Neal made 57 percent of his 2-point shots during his freshman season at LSU. Neither Hall of Fame center ever reached 70 percent during their respective three-year careers. Williamson is doing things we just haven’t seen a 6-foot-7 athlete do in Division I basketball. 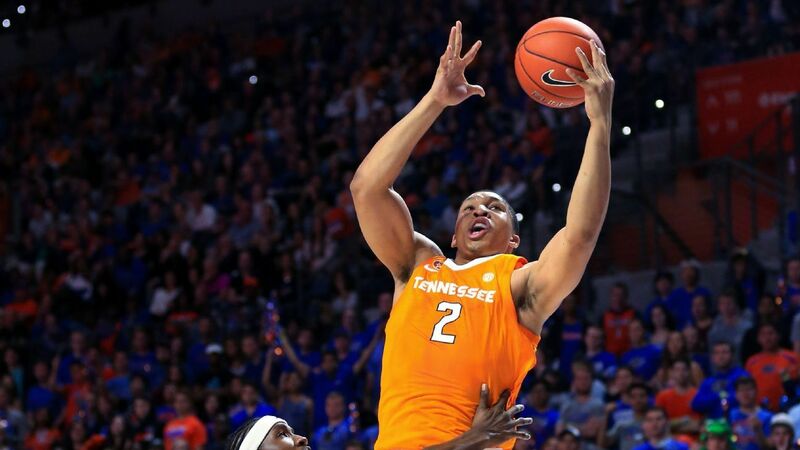 Grant Williams: In a lopsided win over Arkansas on Tuesday, he finished 2-for-7 from the field but also recorded a 14-for-14 clip from the charity stripe. He’s the versatile heart of this Tennessee program. Against Arkansas, he guarded Mike Anderson’s wings and 6-foot-11 NBA prospect Daniel Gafford. He leads the Vols in scoring and rebounding. He’s also second on the team in assists and blocks. He has made 73.2 percent of his shots at the rim and 53.1 percent of his jump shots, per hoop-math.com. RJ Barrett: He’s one of a handful of candidates capable of surging in the final months and taking the award from Williamson. Since the injured Jones could miss a significant stretch, Barrett will likely become the primary ball handler for Mike Krzyzewski. He used Barrett at point guard during the team’s Canadian tour over the summer. That switch should allow Barrett to do even more — and he’s already averaging 23.4 PPG, 6.9 RPG and 4.1 APG. He has scored 20 points or more in 13 of 16 games. In the three games he missed the 20-point mark, he averaged 15.6 PPG. Dedric Lawson: Yes, Kansas will miss Udoka Azubuike, out for the season with a wrist injury. Yet with Lawson leading the team, the Jayhawks have lost just two games, both on the road (Iowa State, Arizona State). He possesses one of the most impressive stat lines in the country: 19.2 PPG, 10.6 RPG, 1.1 BPG and 1.2 SPG. He’s a matchup problem for any team in America. He’s also the reason Kansas remains the favorite to win the Big 12 title and extend its streak. De’Andre Hunter: The NBA prospect scored 21 points (8-for-12) in Tuesday’s 22-point win over Virginia Tech. Markus Howard: A back injury could be the only thing that stalls the Marquette guard who is averaging 24.4 PPG. Cassius Winston: With Winston (17.6 PPG, 7.4 APG, 45.4 percent from beyond the arc), Michigan State has won 10 games in a row and four in a row without Joshua Langford (15.0 PPG), who is still nursing a foot injury. Iggy Brazdeikis: The Michigan star has made 77 percent of his free throws this season. Carsen Edwards: Edwards (24.9 PPG) has helped Purdue climb back into the Big Ten race. Admiral Schofield: He scored 14 points in the first six minutes of the second half in Tuesday’s lopsided win over Arkansas. Rui Hachimura: He has scored 20 points or more in five of the past seven games. Brandon Clarke: He’s a two-way player who is averaging 17.0 PPG and 3.2 BPG. Ja Morant: The nation’s assists leader (10.7 APG) also ranks in the top 15 nationally in scoring (23.1 PPG). Jarrett Culver: Texas Tech lost to Iowa State in Lubbock on Wednesday, but Culver still finished with 20 points and 16 rebounds.